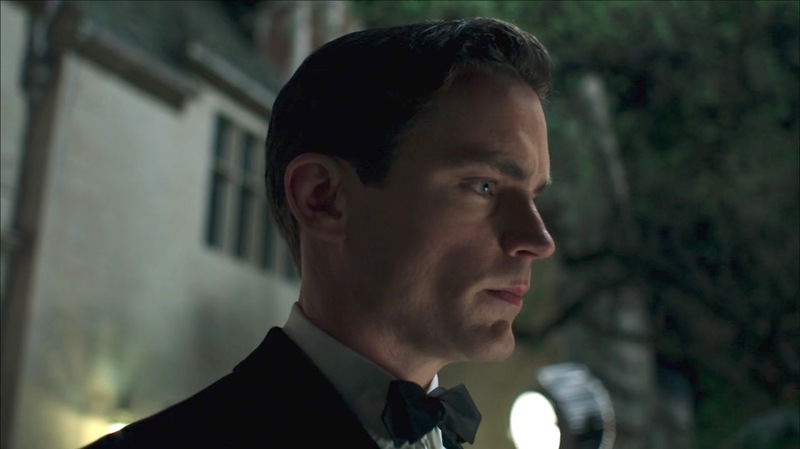 In its brief, nine-episode life, The Last Tycoon was true to its “golden age of Hollywood” roots with an emphasis on style rather than substance… but oh what style it was, and with strong performances to booth with Matt Bomer, Kelsey Grammer, Lily Collins, Rosemarie Dewitt, and others rounding out the talented cast of characters. 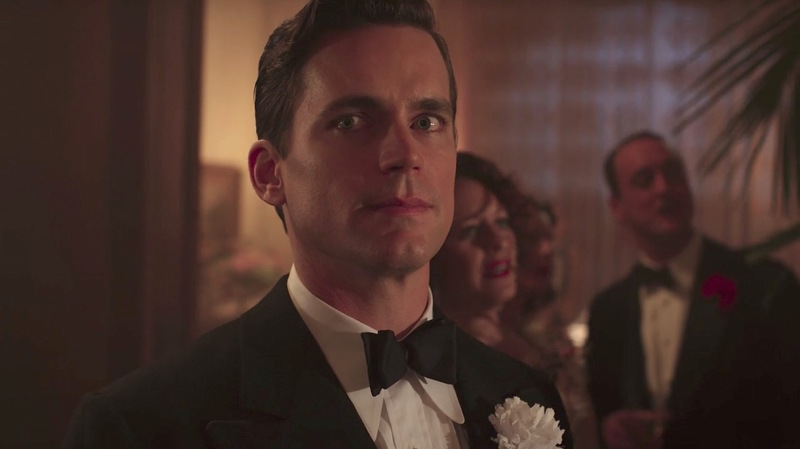 The series also made the most of its dazzling period costumes, the creation of master costume designer Janie Bryant of Mad Men fame; an entire blog alone could be dedicated to the snappy menswear worn by Bomer, Grammer, and Enzo Cilenti. Fitzgerald’s unfinished novel about wunderkind studio executive Monroe Stahr’s affairs and ambitions in 1930s Hollywood formed the basis for the series, but developer Billy Ray was clearly building a more elaborate world for his complex characters when the series was axed. 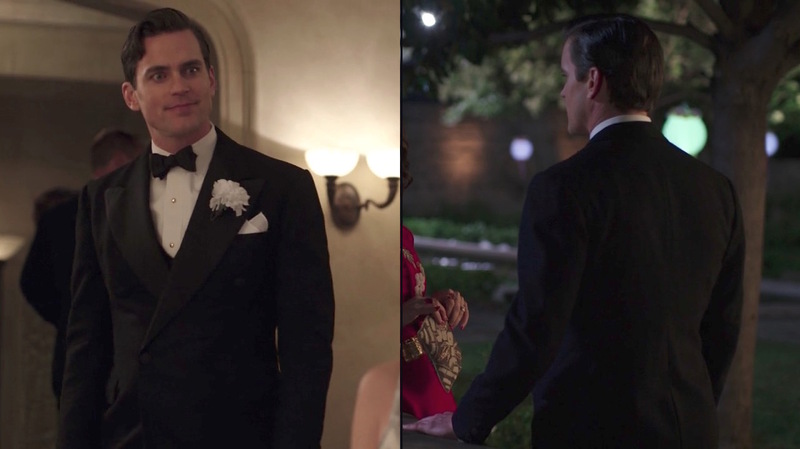 The Last Tycoon‘s dashing titular lead, Monroe Stahr, trots out a debonair black tie ensemble in four of the series’ nine episodes, worn to a number of Hollywood parties whether to celebrate a professional achievement, the holiday season, or his own marriage engagement. 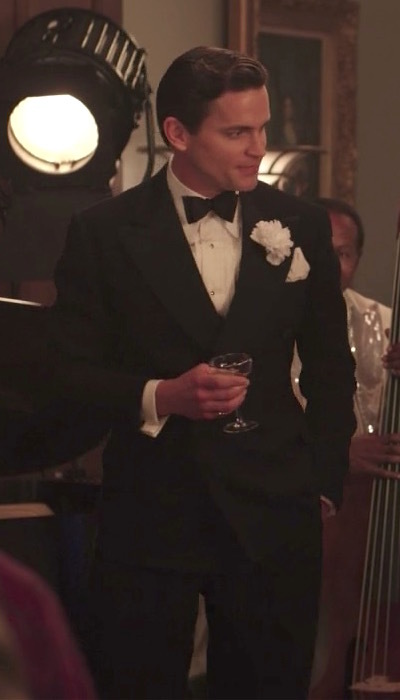 The elegant executive at his own engagement party in “Oscar, Oscar, Oscar” (episode 9). Monroe Stahr’s classic evening kit leaves nary a detail ignored, reflecting the growing popularity of double-breasted dinner jackets during the 1930s especially among the young and stylish like Monroe and his Hollywood set. It was the Duke of Windsor – then the Prince of Wales – who brought double-breasted dinner jackets into fashion during the 1930s. As Black Tie Guide reports, the jacket had been “previously considered too informal for evening wear due to its lack of an accompanying waistcoat,” but this soon-to-be-called “semi-formal” approach caught on with wearers who followed the Prince’s example of wearing it with “a soft-front pleated evening shirt featuring attached turndown collar and French cuffs rather than the traditional starched front shirt with detachable wing collar and single cuffs.” Monroe Stahr follows the Prince’s template to a T, though his addition of a waistcoat would have satiated the critics that remained concerned with the lack of such a garment. Monroe Stahr’s black wool double-breasted dinner jacket has the classic six-on-two button front with the six front buttons and the three buttons on each cuff all covered in black silk. The jacket’s wide peak lapels have straight gorges and black grosgrain silk facings rather than the shinier satin lapels that “were increasingly associated with ready-to-wear apparel.” (Source: Black Tie Guide). Left: A party in “Eine Kleine Reichmusik” (episode 5) calls for a white boutonnière. 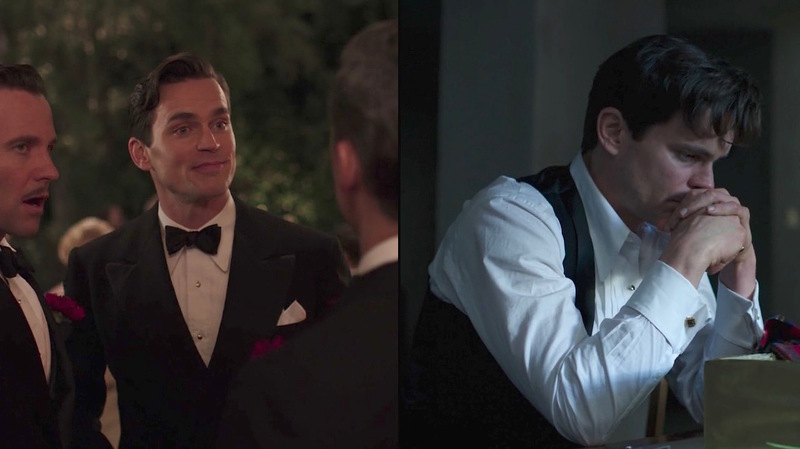 Right: Monroe cuts a dashing figure on the evening of his engagement party in “Oscar, Oscar, Oscar” (episode 9). For extra special occasions, Monroe wears the traditional white carnation pinned to his left lapel as a festive boutonnière, but he always wears a white pocket square – usually linen – in the jacket’s welted breast pocket. The straight hip pockets have a flap, a holdout from earlier decades that would be phased out on the best quality dinner jackets by the end of the 1930s. The ventless jacket is tailored for a close, flattering fit with padded shoulders and roped sleeveheads. 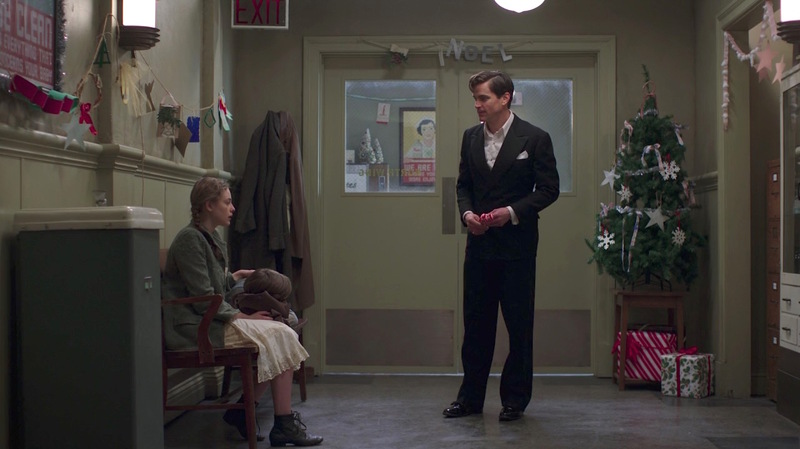 An exhausted Monroe Stahr stands in his black tie kit, sans the actual tie, among hospital holiday decorations in “A Brady-American Christmas” (episode 6). 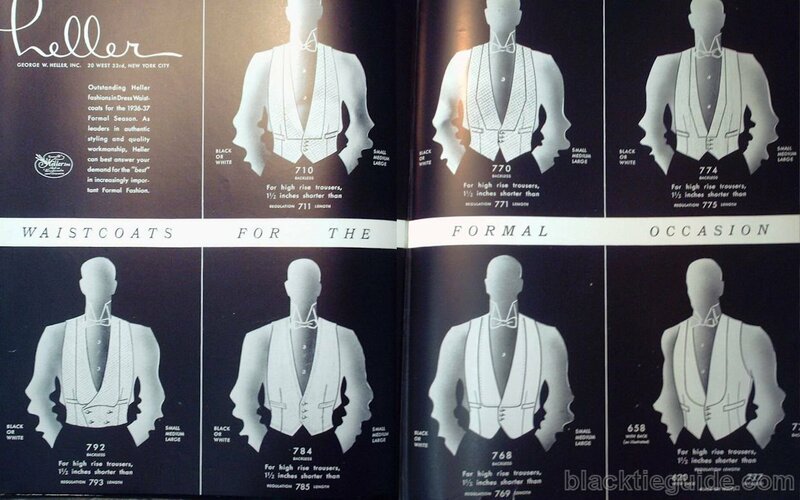 Even during the more formal pre-WWII era, waist coverings – especially waistcoats – were considered unnecessary with a double-breasted dinner jacket given that garment’s full wrap around the wearer’s torso. For Monroe Stahr, however, dressing to the nines means leaving no stone unturned and that means wearing a black wool single-breasted waistcoat to match his dinner jacket and formal trousers. The waistcoat (or vest, if you must) has three buttons on the front, covered in black silk, with a notched bottom and two welted pockets. Monroe’s era-correct waistcoat gets some welcome exposure after rising from a nap in “A Brady American Christmas” (episode 6)… while his white ribbed cotton sleeveless undershirt gets some indecorous exposure. As Esquire‘s inaugural issue hit newsstands in the autumn of 1933, the concept of a formal waistcoat matching the color and cloth of a gentleman’s tuxedo would have been de rigeur three years later as the fictional Monroe Stahr makes the Hollywood rounds in an all-black three-piece dinner suit. The distinctive “drooping” shawl collar of Monroe’s waistcoat would have also been quite fashionable. Introduced in 1921 according to Black Tie Guide, this unique wide-based lapel was a common sight during the ’30s. BTG also posted a portion of this Heller catalog from 1936 that includes several examples of dress waistcoats with lapels not unlike Monroe’s. Surviving vintage models also abound today such as this four-button waistcoat dated to 1938. The black grosgrain silk facing of Monroe’s distinctive waistcoat lapel appropriately matches his dinner jacket lapel facings, his bow tie, court shoe bows, and the grosgrain side braid of his trousers for a cleanly coordinated and consistent look. Even workaholic film producers deserve some rest. No need to look so guilty, Monroe! Monroe wears black suspenders (or braces), the most traditional option for holding up trousers when wearing black tie. The suspenders’ gold adjusters are seen poking out the sides of his waistcoat armholes at the shoulders. For the most part, Monroe’s white dinner shirts echo the styling of his business dress shirts with a fashionably long point collar. The 1/2″-pleated front of the shirt is elegantly accented with round gold-rimmed diamond studs. His sleeves are shirred at the wrist with four closely-spaced pleats, and the squared double cuffs are fastened with plain gold cuff links. Monroe’s white “semi-formal” shirt in various states of dress in “A Brady-American Christmas” (Episode 6). 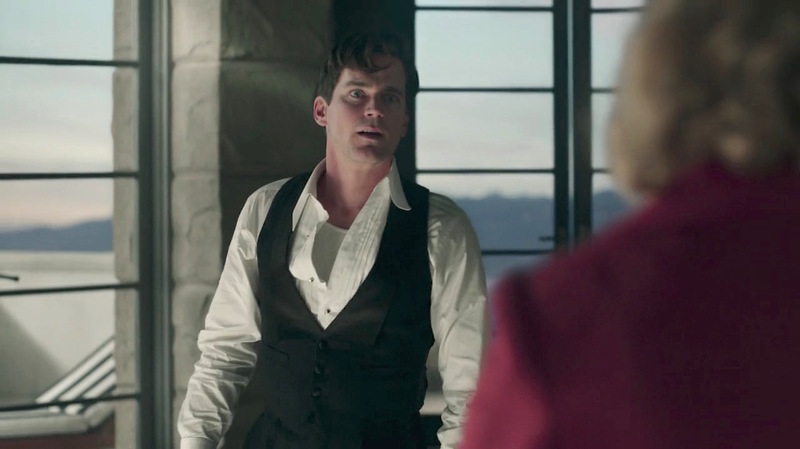 Monroe deviates from his usual semi-formal shirts in the fifth episode only. In “Eine Kleine Reichmusik”, he again wears a white cotton dinner shirt with a turndown collar and pleated front, but both the semi-spread collar (not a point collar) and the pleats on this shirt are considerably narrower. Monroe’s standard semi-formal neckwear is a black silk butterfly-shaped (or thistle-shaped) bow tie made from the same duller grosgrain silk as his lapel facings, reflecting a level of coordination that was becoming increasingly accepted and expected by the mid-1930s. 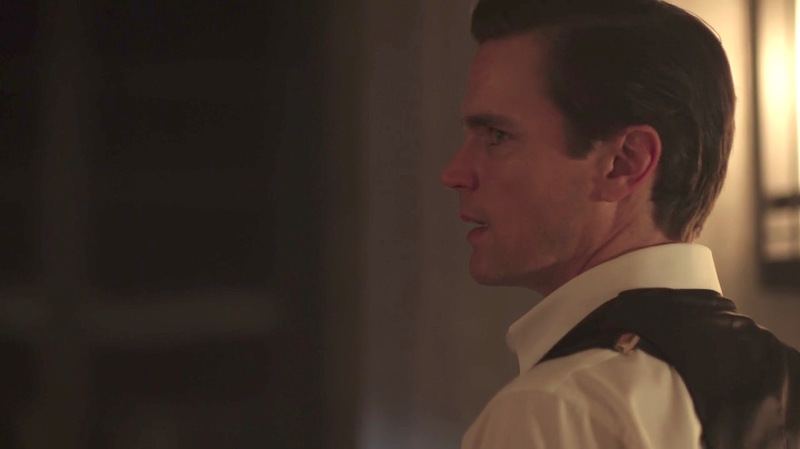 Monroe’s piercing glare is as sharp as his collar point in “Oscar, Oscar, Oscar” (episode 9). 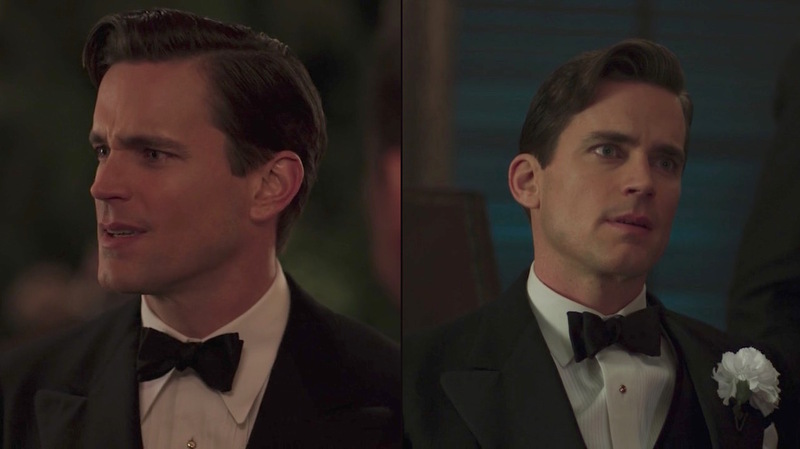 Butterfly and semi-butterfly bow ties were most common for men during this era, but the diamond-pointed bow tie that Monroe wears in the first episode would have also been acceptable. 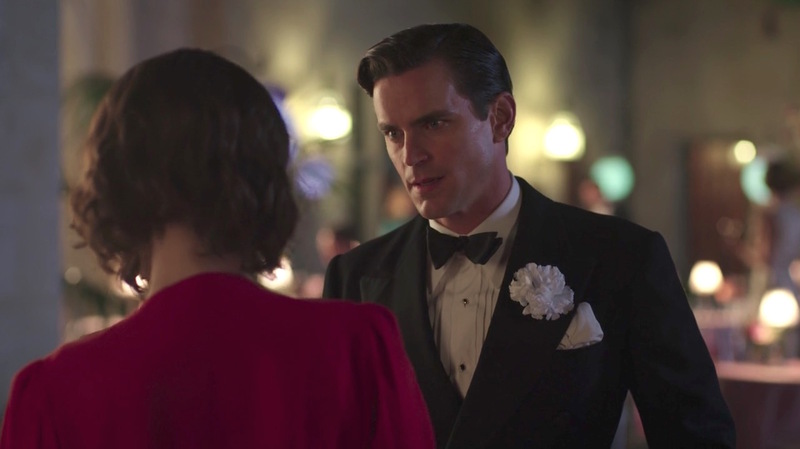 Monroe Stahr wears a less common, but still acceptable, pointed-end bow tie in the first episode of The Last Tycoon. 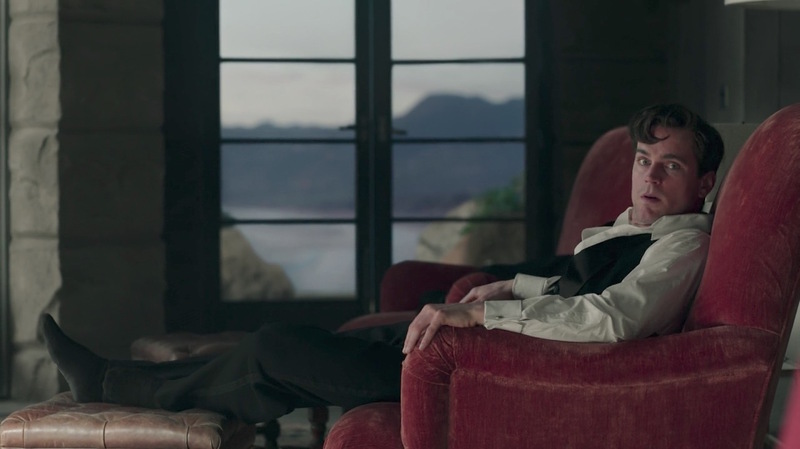 Despite the lessened formality of his double-breasted dinner jacket and soft-fronted, turndown collar shirt, Monroe Stahr appears to be wearing the most formal footwear option: black patent leather pumps. The men’s dress pump traces its origins back to the Regency period when gentlemen would swap out their daytime boots for buckle-fastened pumps. It was naturally the influence of Beau Brummell that led to the silver steel buckle being replaced by the more genteel square grosgrain bow has distinguished the opera pump in essentially the same form for nearly 200 years. 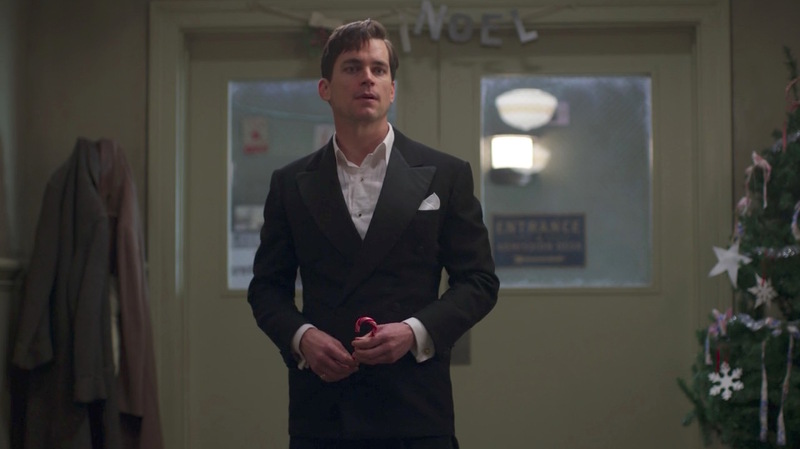 Monroe also sports his opera pumps when wearing his most formal white tie and tails in the first and last episodes of the season, a context where opera pumps are more frequently seen than with the less formal black tie. 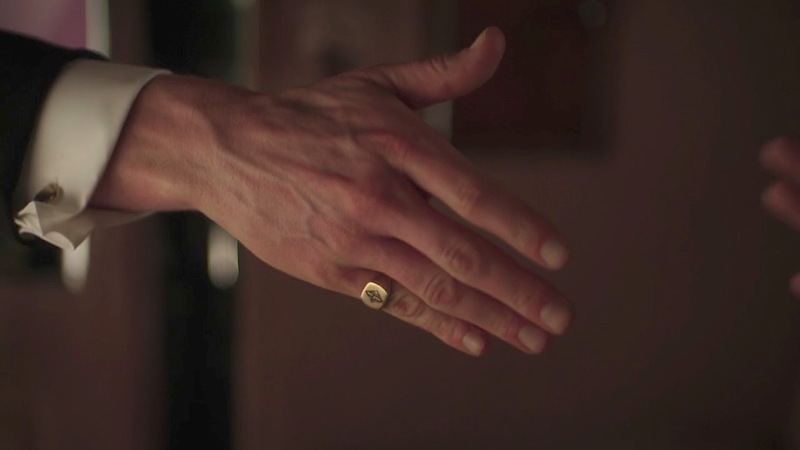 No matter what the context, Monroe always wears a gold signet ring on his right pinky. Though the etched “S.” most assuredly stands for his professional surname of Stahr, it could also designate his birth surname of Sternberg. Monroe begins the series wearing a yellow gold wristwatch with a tonneau-shaped white dial and gold bracelet, a standard men’s dress watch of the era. By the end of the fourth episode, he’s received two brand new wristwatches as birthday gifts*; the first is a gold tank watch from Louis B. Mayer (Saul Rubinek) followed by a steel round-cased watch, a gift from Monroe’s own boss Pat Brady (Kelsey Grammer) in his attempt to “one-up” the legendary Mayer. It is this steel watch with its minimalist white dial and black leather strap that Monroe wears for the duration of the season. * The episodes featuring Monroe’s birthday are set in early-to-mid September, making him the second consecutive Virgo character to be featured on BAMF Style after Monday’s post about Tony Soprano. 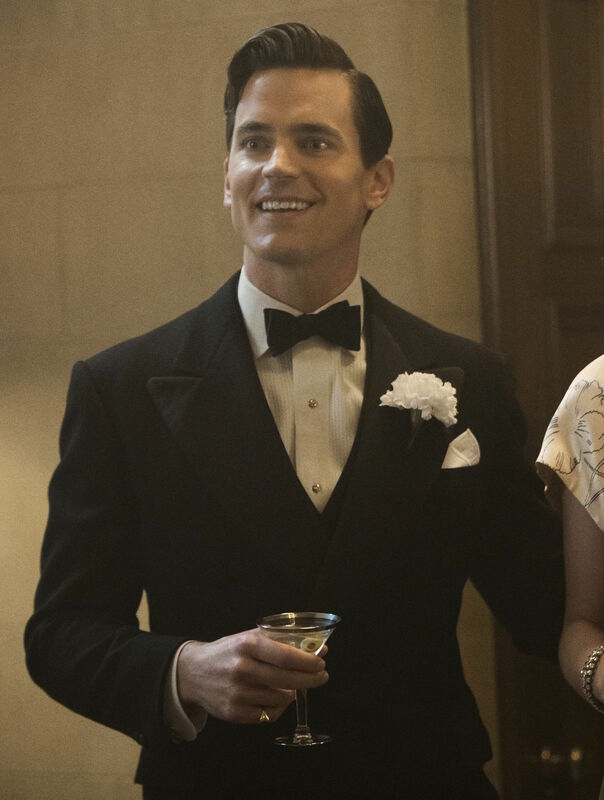 Matt Bomer as Monroe Stahr on The Last Tycoon (Episode 5: “Eine Kleine Reichmusik”). Note the shirt’s semi-spread collar and narrow pleats as opposed to the point-collared shirt with wider pleats that he wore in other episodes. Monroe Stahr exemplifies the perfect balance of fashion-forward formalwear and honoring black tie tradition with his tailored three-piece double-breasted dinner suit. Monroe always wears a white linen display kerchief in his jacket’s breast pocket and, for extra special events, a white boutonnière in his left lapel. Series star Matt Bomer is a graduate of Carnegie Mellon University, located just two miles from my home in the Squirrel Hill neighborhood of Pittsburgh, Pennsylvania! If you’re interested in the history of formalwear, check out Black Tie Guide’s comprehensive history of vintage black tie. 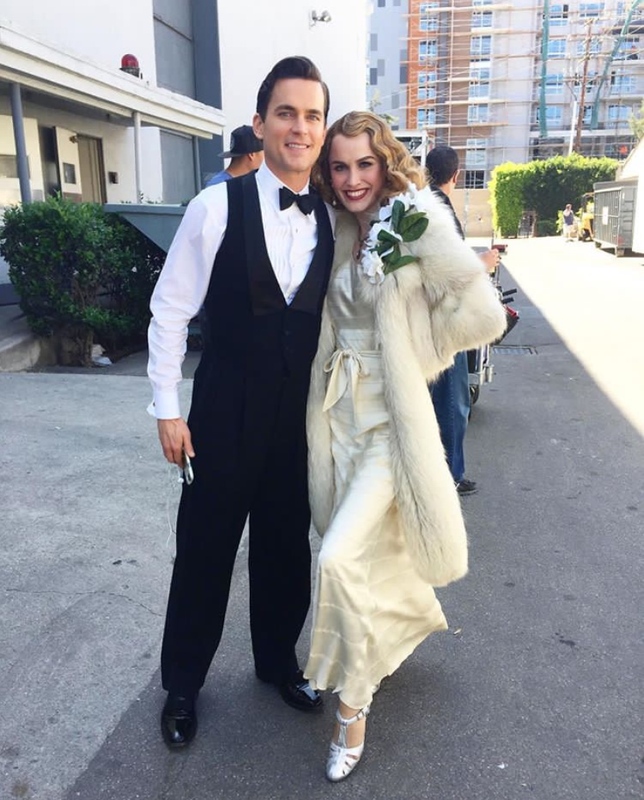 To learn more specifically about the pre-WWII Depression era depicted in The Last Tycoon, Black Tie Guide’s also got you covered. I’d not heard great things about this series, which may explain its cancellation. Perhaps I ought to check it out though. There’s definitely more of a style-before-substance emphasis on the show, but it certainly nails that style with exquisite costuming, props, set detail, and music. It brought me right into the world of 1930s Hollywood and I think that it could have ascended to greater things with more time to mature. I’d welcome your thoughts if you decide to check it out!